"Thank you so much. Your show was the highlight of the festival"
Does your event need a JUGGLING show or a juggler to walk around and entertain the crowd? Or would your event benefit more from a FIRE show or an EDUCATIONAL program? Shows can be customized for your event, call for a consultation. It's not too late to book Peter for your event. Call or text Peter at 402-906-5823 for booking information. 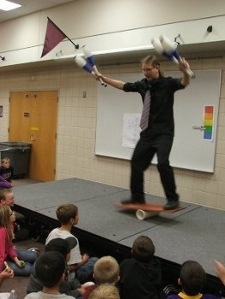 More than just a world class juggler! Unbelievable juggling skills combine with daring stunts and hilarious comedy in this show you can’t miss. 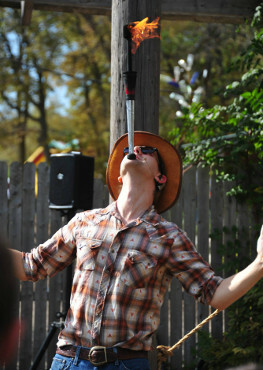 Whether controling seven balls rings and clubs on all parts of his body, juggling knives while blindfolded and standing on a rola bola, or walking a 7 foot tight rope, Peter’s show is bound to delight and impress. Winner of numerous awards, including an extreme juggling gold medal and a blind juggling world championship, Peter Brunette has over 20 years of performing experience. His current show, a perfect fit for children and adults, has been seen across the country at theaters, renaissance festivals, art museums, schools, fairs, festivals, and corporate events. Trouble viewing or want more? Visit the YouTube Page. Don't hesitate to contact Peter for more information. Prices and packages are available for all budgets and events.